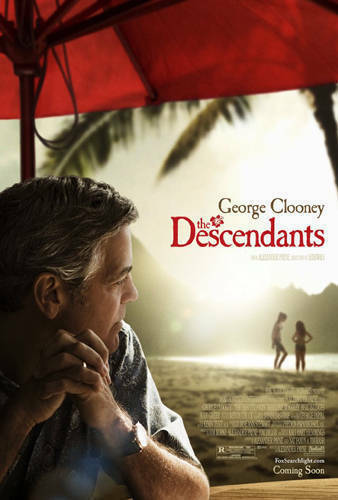 The Descendants is a dramedy based on the novel by Kaui Hart Hemmings directed by Alexander Payne. It uses authentic Hawaiian music, and was filmed on location in Hawaii, notably Honolulu and around Hanalei Bay. We meet a woman as she is happily jet-skiing on a Hawwain beach. We then flash to her husband Matt King (played by George Clooney) who is a lawyer, father of two daughters and the sole trustee of a beautiful and large plot of land on the island of Kaua'i. Matt has to decide what he wishes to do with the land as the family trust will soon expire. Before Matt and his many family members formally decide on a deal to sell the land, Matt learns of a boating accident involving his wife Elizabeth, where wackiness ensues! The Descendants is the long awaited movie from the director of SideWays, a movie that explored the relationship between two middle-aged males at one of life’s cross-roads, nestled in the beautiful Napa Vally winery region. Here, we are in Hawaii, and the environment, atmosphere and ambience is palpable. You can feel the heat of the breeze, smell of the ocean and completely understand its inhabitants’ cruisy way of life as dictated by the surrounding environment, much like the Australian tropics. Reportedly, George Clooney wanted to play the role of 'Jack' in Sideways, however Payne turned him down, saying that he wanted someone lesser known for the role, Thomas Haden Church, best known for his role in television’s Ned and Stacey at the time. Here George Clooney gets his chance, and headlines with a relaxed, scruffy, quiet, gentle type of character, which is most notably his flaw. This time around however, George is accompanied by a trio of young actors who more than make up for this character trait, none-more so than his on-screen daughter Shailene Woodley. At first glance Matt’s daughter’s (including Amara Miller) and his eldest daughter’s dim-witted beach dude friend (played by Nick Krause) are quite straight forward spoilt little brats who unravel during the film to show well-rounded characters whose true selves do give way during this horrible crisis. The tone of the movie is interesting: amongst a very serious and morbid plot device, the director does not shy away from the fact that George’s wife, and mother to his children, is extremely morally flawed and is unglamorously hospitalized, looking like a corpse in front of her friends and family. George’s mission to make sure all of her family and friends receive the opportunity to say good-bye, amongst pressure from his extended family to sell the plot of land to the ire of residents, lays a ground-work for effortless characterization (no head-bopping here!) which, amongst a grim background, is funny in the delivery due to the way the characters are: a family that, despite all of their history and gripes, do actually love one another and who do look out for, and after, each other, when they are needed the most. I give The Descendants 4.5 ukuleles out of 5. Fully deserving of its Golden Globe successes (best film, best actor)!